Spider-Man begins! Emma Stone is gorgeous! POTENTIALLY MASSIVE SPOILER ALERT! PROCEED WITH CAUTION! 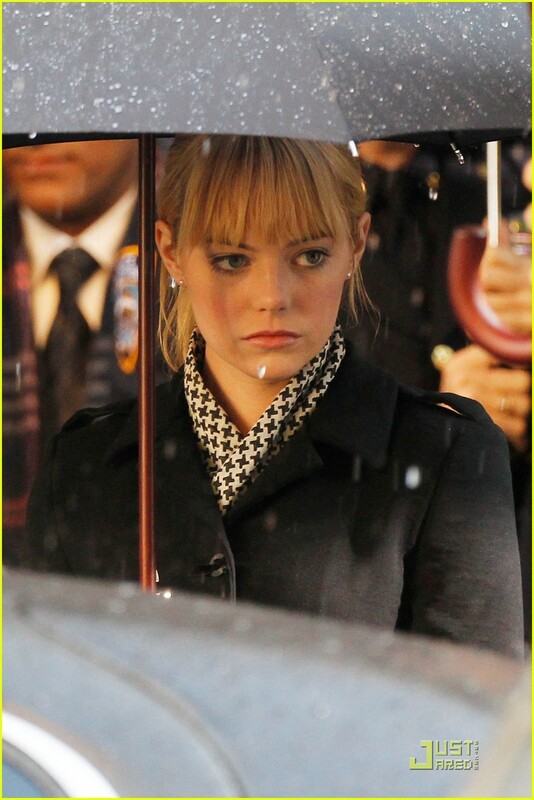 My girlfriend Emma Stone is filming scenes as Peter Parker’s first true love, Gwen Stacy, for Spider-Man, and she looks amazing. Here’s where you should maybe stop reading if you don’t want to know anything about the movie yet. The photos show an obvious funeral scene. But whose? Uncle Ben’s (played by Martin Sheen)? Maybe it’s for her own father, Captain George Stacy (Denis Leary)? It looks like there are lots of cops behind her, which would suggest a police funeral. Who knows? All I know is that she’s beautiful. Lots more photos can be found at Just Jared, and all my previous Spider-Man articles are here; the casting choices are definitely burning away my deep and twisted Spider-Man 3 bitterness, and I’m getting very excited about this. 2012 is going to be a crazy year for superhero movies, isn’t it? Wolverine, Avengers, Spider-Man, Batman, Superman. I need to start saving now for movie tickets and nachos. Also! Cinematographer John Schwartzman talks some really cool tech stuff about how the movie’s being shot in 3D with the RED digital camera system right here. Fascinating stuff. Confounding, but fascinating.